It’s the day of love, so we’re doubling your referral credit and giving you a chance to win free rides. Only on Feb 14th. Get referring! Click here to go to Ola cabs Free Rs. 200. And Share Friend earns Rs 100 and the chance to win free rides for a month? Get referring NOW! On this day of love, we have some delightful news for you. 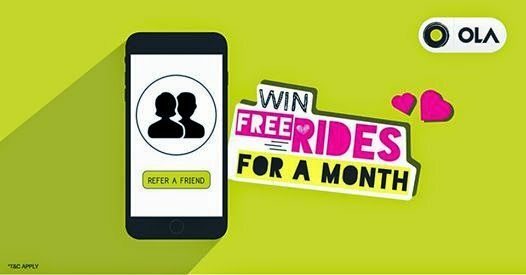 20 lucky customers who refer their loved ones on Feb 14th will stand a chance to win free Ola rides for a month! Well, wait. That not all. If your referred friends sign up and take a ride within the next week (14th February 2015 – 21st February 2015), you will get double referral Ola money, i.e. Rs.200 ola money for every friend you refer! To participate, simply invite your loved ones on 14th Feb 2015 with your referral code. You can share your referral code via email, SMS, Whatsapp, Facebook and Twitter. Winners will be chosen by a lucky draw and declared on Facebook and via E-mail. Rs.100 extra referral money will be credited at the end of the Valentine week. Referral amount will be credited only if the referred has completed one ride. Free rides are upto Rs.200 per day and will start from 23 February 2015 to 23 March 2015. Rs.200 vouchers will be sent via email daily. Ola Money is valid only on Cab rides. Ola reserves the right to change the terms & conditions at any point of time. Referral amount given will have the same T&Cs as Ola’s existing referral program. So go ahead, double the fun this Valentine’s Day, refer your loved ones and spread the love!